Geographer, astronomer, globe maker, cartographer, land surveyor, mathematician, publisher. The first person to refer to a collection of maps as an “Atlas”, after reading Philosophy and Mathematics under Gemma Frisius at the University of Leiden (Netherlands), Mercator gained considerable acclaim for his cartography work. 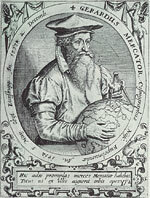 Upon introducing his eponymous cylindrical map collection in 1569, Mercator achieved long-lasting international recognition. Indeed, the Mercator Projection is still used within the aviation and seafaring industries to this day. Upon his death, Mercator’s copper plates were bequeathed to Jodocus Hondius. A keen traveler, Abraham Ortelius started out as a map-maker before moving on to the more profitable business of collecting and selling maps in order to fund his voyages. 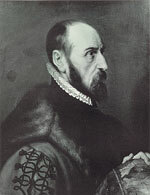 A popular man, Ortelius was even able to count Gerard Mercator to his list of acquaintances, who was no doubt keen to hear about the accomplishments of his fellow Fleming. Ortelius’ magnum opus was without doubt the Theatrum Orbis Terrarum – now considered to be the world’s first modern atlas. Published in 1570, the atlas was the most successful of its time, published in almost 50 editions across seven different languages over 42 years. Once a pupil of the Danish astronomer Tycho Brande, Willem Janszoon Blaeu began his career as a globe maker, before eventually going on to form the 17th century’s leading cartographical publishing house. Starting with the production of various sea-atlases in 1608, Blaeu soon diversified, going on to publish the first edition of what was intended to be a two volume work. Ultimately a collaboration with his son, Joan Blaeu, under the helm of Blaeu Jr. the atlas soon took on a life of its own, eventually growing to a nine to twelve volume behemoth which featured a grand total of 600 atlases. As a fire tore through the printing works in 1672, much of the Blaeu company was destroyed. After the death of Joan Blaeu one year later, his heirs commenced the sale of his estate. After initially finding work as an engraver and instrument maker in London, Hondius moved to Amsterdam in 1593, where he found employment as a publisher of maps and books. It was in Holland’s capital that Hondius acquired Gerard Mercator’s famous copper plates with the help of Cornelis Claesz, the city’s most important publisher of all things cartographical and geographical. In 1606 the duo published an extended edition of the famous Mercator atlas. Hondius’ good work was continued by his two sons and their brother-in-law. Jodocus Hondius Jr., Henricus Hondius and Johann Janssonius were responsible for further extended editions of the Mercator atlas as well as various other multi-volume atlases. Part of a famous map-making family, Nicolas Visscher learned the tricks of the trade from his father, the famous cartographer and publisher, Claes Fischer (1587 -1652). After his death in 1652, Nicolas, a keen traveler, continued to follow in his father’s footsteps, achieving recognition in particular for his detailed wall maps of Holland. This famous theologian and cosmograph studied Mathematics and Astronomy before eventually becoming a Professor of Cosmography. During his studies he produced an interesting collection of 44 maps, but it was only after moving to Basel that Münster achieved recognition on a grand scale. After publishing a Latin edition of Ptolemy’s Geographica in 1540, the professor then went on to create the earliest German language description of the world: Cosmographia. Published in both German and Latin, Münster was also the first person to divide the world into four continents and the first to produce a detailed regional map of a Swiss Canton (Wallis). Münster’s work counts amongst the most important of this era. Despite training as a notary, Johann Baptist Homann went on to become a geographer, cartographer and publisher. Based in Nuremberg for much of his professional life, Homann practiced copper plate engraving from an early age. In 1702, he published a so-called war-map of Italy independently, to great acclaim. Further maps were adorned with full color illustrations, much in the style of Johannes Hübner. His first atlas was published in 1707 and contained 40 maps, forming a precursor to 1716’s famous Grosser Atlas über die ganze Welt (Grand Atlas of all the World). This collection contained an impressive 126 individual maps. Appointed Imperial Geographer in 1715, Homann also served as a master globe producer. Estimated to have produced 200 maps himself, his company, Homann Erben, existed until 1848. Even as a youngster, Vincenzo Coronelli was encouraged by his teachers to pursue a career in either Mathematics or Cosmography. After completing his formal education, he began to produce decorative globes for the likes of Louis XIV. After returning to Venice, Coronelli formed the very first geographical society, the Accademia Cosmografica degli Argonauti. In his role as lector at his hometown university, he was able to create over 500 different maps – some of which appeared within atlases and some of which were produced as standalone works. Coronelli also acted as an adviser to the Doge of Venice during the height of the city’s powers. Upon marrying the daughter of Jodocus Hondius, Johannes Janssonius was invited to join the family business, working alongside his borther-in-law, Henricus Hondius, before ultimately going solo. A more than competent producer of maps and globes, it wasn’t long before Janssonius emerged as a serious competitor to the Blaeu Publishing Company. Responsible for the six-volume Atlas Novus, his eight-volume “townbooks” and the publication of Andreas Cellarius’ Atlas Coelestis, upon his death in 1664, his work was continued by a company called Janssonius van Waesbergen. A loyal pupil of Johann Baptist Homann, Matthias Seutter opened his own cartographical workshop in 1707 in Augsburg. A producer of both globes and maps, he created his first series of atlases in 1728, going on to publish the Atlas novus, Atlas minor and Großer Atlas (Grand Atlas). Upon his death in 1756, Seutter’s business was taken over by his son, Albrecht Karl, and his two step-sons, Conrad Tobias Lotter and Johann Michael Probst. Lotter later went on to run the business under his own name.